Happy 2019 everyone! Hope you all got a great start of the year by being with your families, friends and loved ones and hope that you have exciting things to look forward to. 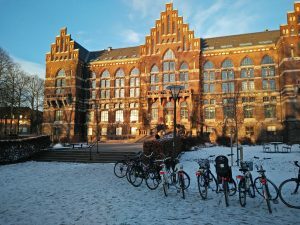 Today it’s 15th January and for some is mid-January, but for others it might be the last day to apply for the master’s programme in Biotechnology in Lund! Sweden is a country with one of the highest living standards in the world, which is reflected in the public spaces, institutions and people’s lifestyle. Despite having such a large area, the population is quite small (around 10 million people) but depending on location very culturally diverse. Lund is in a region called Skåne, which has kind of its own history since it used to belong to Denmark. People here speak in a dialect called “skånska” or skånish let’s say in english. So if you intend to learn swedish, you’ll be able to do so but brace yourselves to understand locals! Someone I know from Skåne went once to Stockholm, and they asked him to speak in English cause they didn’t understand him! But don’t get discouraged, it was just a funny anecdote. By putting effort Swedish will come easily no doubt. One of my favourite things about Sweden I’d say it is the level of collective awareness Swedes have, they are all very polite and everyone speaks English sufficiently well, no matter where you go, they always do (and I’ve been living here a year and a half). They love their music (schlagger genre, Abba, Veronica Maggio, Tove Lo, Timbuktu among others), Zlatan Ibrahimovic and fika. Fika is the word you’ll find everywhere, and it is having a coffee with a pastry or a piece of cake, which is done everywhere else in the world but here it is nationally recognized as their kind of ritual to switch off at work, dating or just have a cozy time with friends. It is actually a verb! To sum up, a picture of the most iconic place of Lund, the LU library winter edition. Are you really gonna miss this?